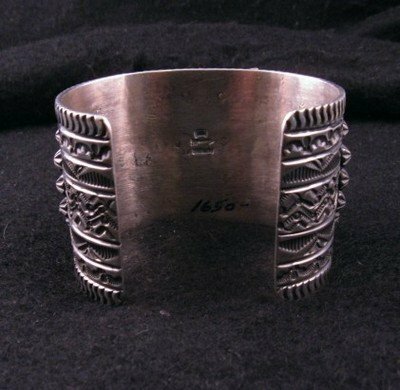 This Native American cuff bracelet was made by Navajo artist Darryl Becenti. The bracelet is set with a large genuine turquoise stone - gorgeous deep sky-blue color with reddish & tan matrix - polished perfectly smooth with no cracks or chips, just natural matrix. 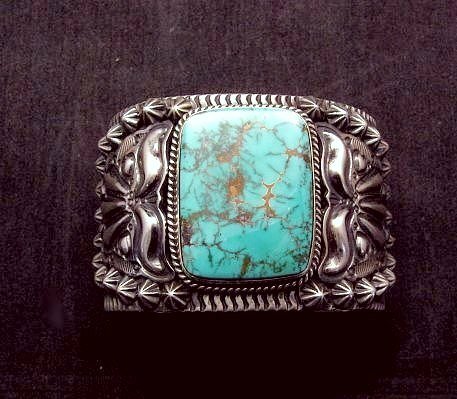 The stone sits in a plain bezel with a beautifully twisted wire of sterling silver at it's base and applied repousse work on either side. 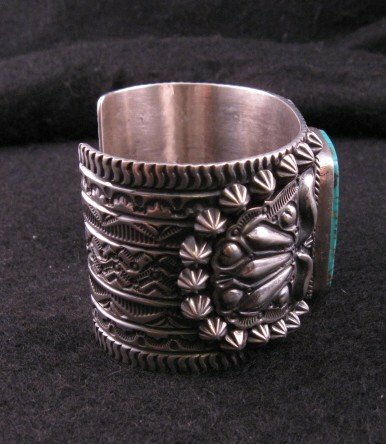 The cuff is covered end to end with deep stamp-work, applied repousse work, silver beads and more. 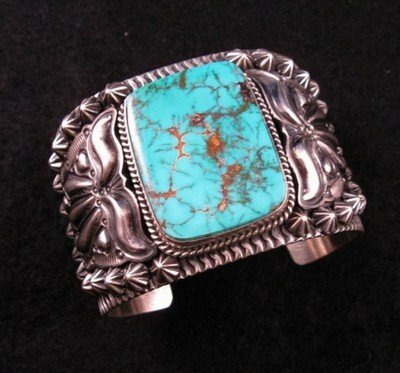 This sterling silver and turquoise bracelet was created by Navajo silversmith, Darryl Becenti. 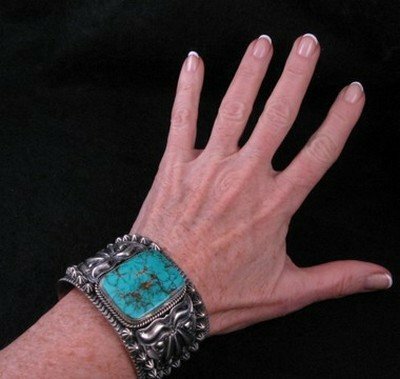 The sturdy bracelet measures 1-3/4 wide, with an inside end-to-end measurement of 5-3/8 plus there is an opening gap of 1-1/4. 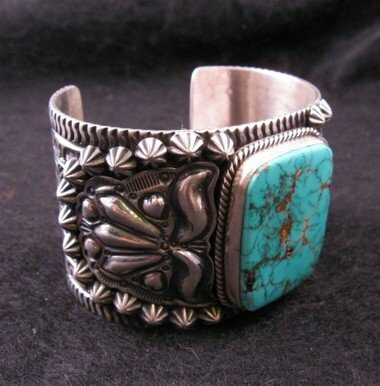 The bracelet weighs 136 grams. Brand new in perfect condition. It is stamped sterling and has Darryl Becenti's hallmark. Certificate of Authenticity included and gift box included. 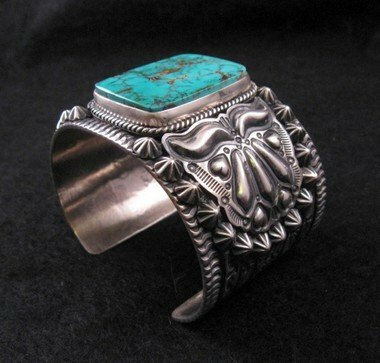 Darryl Becenti was born in 1957 in Gallup. New Mexico. 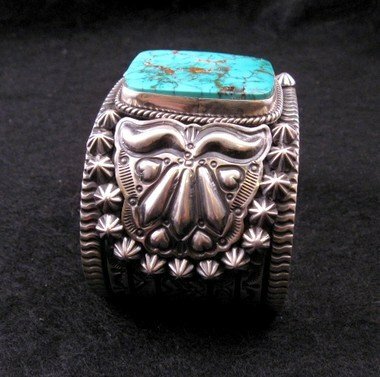 He was taught silver work by his brothers-in-law, David & Leroy Reeves in 1980 and he is the brother-in-law to the famous Sunshine Reeves, Gary Reeves, David Reeves, Andy Cadman, and Darrell Cadman Clan. Darrell makes his own stamps and dyes, and heavily employs magnificent stars, fans, scallops, shells, and elaborate appliques in all of his jewelry. 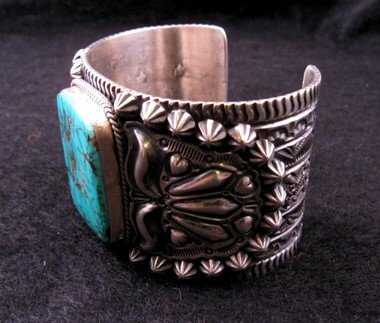 His jewelry is highly prized for it's deep hand-stamped Navajo designs, repousse silver work, and thick gauges of silver.